Augmented Reality (AR) seems to have gone from “technology of the future” to “technology of today” rather quickly with the popularity of Pokémon GO. Virtually overnight, the new app has revitalized the Nintendo game originally released in the 1990’s, allowing players to explore the real world and virtually catch strange creatures with their fingertips – and this is just a glimpse of AR’s capabilities. AR is the integration of the user’s environment with digital information. As of now AR does not play a substantial role in the human resources landscape but given its potential, that is soon to change. Pokémon GO is not the first attempt of launching augmented reality into our everyday lives, although it has definitely made the biggest impact, especially among millennials. Just look for those in their 20s walking around aimlessly and peering into their phones—they’re likely playing the game. Many other industries beyond gaming have already started dabbling in AR. Retailers of all kinds are already making great use of the booming technology. Furniture stores like IKEA allow users to virtually visualize furniture in their room, makeup brands like L’Oréal allows users to try on different makeup products using the technology, consumer brands like Coca-Cola have taken to Blippar, a popular AR app, to provide exclusive activities tied to events, and some big name fashion brands have implemented virtual fitting rooms. The way that the digital layer is adding value to the physical world is becoming a huge sensation for many users and its growing popularity is not stopping anytime soon. According to ABI Research, AR is projected to reach $100 billion in total market worth by 2020. So what does this have to do with recruiting and hiring? Considering 72 percent of candidates use their mobile device during their job hunt, according to an iCIMS study, it should be a no-brainer that AR will benefit your recruiting efforts. Job seekers will be able to point their phone right at your building or office and would then be offered an array of information about your company, including job postings, employee testimonials, a look inside and much more. If there is anything to learn from the technology revolution thus far, it’s that any drop in the water can create a huge splash and the AR wave has just begun. Soon enough the candidates passing by your company’s office or advertisements will be getting a full tour with their thumbs. Layer on the digital, recruiting is about to get augmented. Here’s where this new engaging technology can add value in your recruiting efforts. 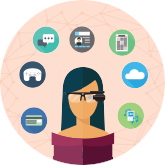 Augmented reality will be more than just a shiny new toy for your company. It will be a sure-fire way to attract and engage talent, particularly millennials who are ultimately tech savvy and attached to their devices. Using AR is a great way to show off everything your company has to offer in four inches. Employment advertisements will come to life when candidates scanning a poster are greeted with more than just a website. Imagine, the posed employees in the photograph awaken to give a testimonial and prompt the users to job postings and other job seeker resources. With the growing interest in working from home, job seekers are definitely looking to ditch their commute. According to the U.S Bureau of Labor Statistics, 35 percent of people in professional and related occupations did some or all of their work from home. Companies can use this technology to their advantage to attract local talent. Once AR takes off in human resources, job seekers will be able to simply walk through an area and check out companies, especially in urban areas where they can explore dozens on a single street. At this point, job seekers expect engaging experiences from employers, and with the use of this technology, employers can crank their efforts up a notch. Job seekers are no longer looking for a one-way stream of information about a company—they want some way to interact. This is in part why social media plays a large role in the job searching process, allowing them to like and comment on posts by an employer. With AR, employers can provide an engaging experience every step of the way. The interaction could start at the moment a candidate scans a poster and continue all the way to employee onboarding. The technology would allow candidates to connect to a recruiter, submit a resume and depending on the job or industry, participate in activities related to the job. Then, before a candidate comes in for an interview, they can take a tour of your office on their phone, meet departments and engage with other information they’ll need to know before they step foot in the door.